In the ruins of an abandoned Soviet military hospital in northern Hungary, two impoverished Roma boys are scavenging for old supplies or weapons they could sell on the black market when they find more than they ever anticipated. The resulting chain of events threatens to blow the lives of a frightening number of people into bits and pieces. 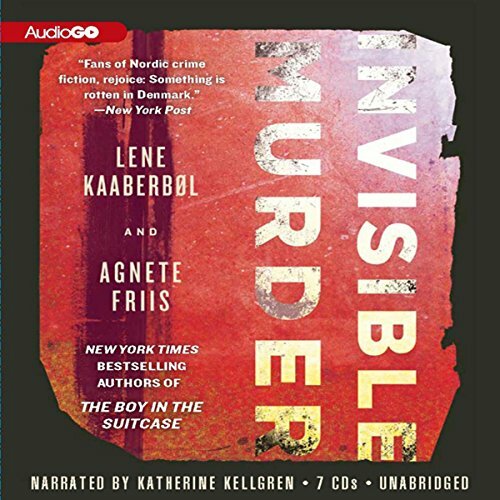 Would you consider the audio edition of Invisible Murder to be better than the print version? Katy Kellgren's reading is AMAZING. She's dramatic without being OVERdramatic, and is easy to listen to. I LOVED The Boy in the Suitcase, so was eagerly awaiting this new book. It's as good as everyone says - as good as the first, with more Nina Borg character development. Don't want to give away anything, but there are definite surprises along the way. Narrator Mistakes - Where is the Editor!?!? Katherine Kellgren's voice is easy to listen to and appropriate for this story, but where the heck was the editing and quality control??? There are many examples of a line being repeated, and at 11:50 of chapter 11 we are subjected to hearing the narrator stumble and exclaim with frustration. DISTRACTING! Kaaberbol and Friis are very adept at weaving together the stories of multiple characters and points of view into a story with good forward momentum. I have to say, though, that I find the principal character in this book and the last, Nina Borg, to be fairly unappealing and not at all an individual I can identify with or root for. The audiobook is sorely in need of editing. The narrator will re-read a section more than once, occasionally interjecting "Oh! He's supposed to be Hungarian!" or something like that. I'm also not fond of her transition from reading to overacting in tense plot moments. All in all, although the plot is good, I would find it hard to recommend this overall. I loved the story, but I wish I’d read the book myself. The editing was so poor that I wonder if there was any effort made at all. The narrator’s mistakes were left in, and it was incredibly frustrating. It didn’t help that she over-acted throughout. I usually like Katherine Kellgren, but she not at all add to my enjoyment of this book. All in all, this was a very disappointing listen. This may become my first Audible return. It took me several attempts to get through this book. The sloppy editing was truly annoying. Nowhere near as good as the Boy in the Suitcase. I purchased this because it part of the Soho Crime Press catalog and I usually enjoy international stories. The story was a bit confusing and was not helped by what were obvious production glitches. Once would have been ok but they kept happening, as if the editors forgot to delete mistakes of narrator. Would you try another book from the authors and/or Katherine Kellgren? So, I have to say up front that I really hate the way this woman performs a book. Her voice is grating and she will suddenly increase her volume the moment anything is meant to be getting dramatic. If you are listening with earbuds, it's especially awful! I just cannot listen to any more books read by her. This production, though, was worse than usual because of all the editing errors. What the hell?! On many occasions she says something over and over, I suppose trying to get it right, but the wrong ones were never edited out. She even makes an aside or two. Very confusing and so annoying. Maybe if it had been free, I could have overlooked these, but it is unprofessional to put a book so poorly edited out for people to purchase. The story...seriously, I got so annoyed with the grating voice and the poor editing that my experience of the book was just ruined. I do think it is a good story line. But I won't be reading any more Nina Borg books because of this poorly produced one. She detracted SO much, as I stated. I can just never listen to a book read by her, I guess. Hate her voice and way of reading. A desire to have my money back. Loved this story and have discovered a new author duo I will watch for. Singular Problem: UNEDITED VOCAL TRACK! This is the final read but uncorrected. There are at least 3 if not more places where the reader starts over either due to not liking her pronunciation or getting tangled in the sentence. Normally these areas are cut prior to issue on the final edit. Well written, plot driven book with well-rounded characters. Would you listen to another book narrated by Katherine Kellgren? Audio editing left a lot to be desired. The narrator's false starts were left in. Not too interesting to me. A lot of words were repeated . To be honest, I gave up listening after chapter eighteen. My reading time is too precious.